Yes, we’ll finally start our day at the Board of Elections, where officials will count the absentee ballots to determine once and for all if Democrat Andrew Gounardes actually beat street safety pariah (and eight-term State Senator) Marty Golden. Gounardes holds a seemingly insurmountable 1,100-vote lead. Did you hear? It snowed. So, naturally, everyone’s commute (except cyclists!) was messed up. (NYDN, NY Post) The Post then had two more articles, first playing it straight, but later focussing on the outrage. The MTA was in the news a lot, thanks to its regular board meeting. The Times, amNY, NY1, Politico and the WSJ) focused on the perfect storm of fare hikes and service cuts. The Daily News focused on Andy Byford catching a would-be fare beater. And Streetsblog pointed out that Byford thinks enforcement cameras are better than cops. One day after Politico reported that an obscure Albany panel might have a say over Gov. Cuomo’s Amazon deal, the governor said, no, that isn’t going to happen. (NYDN) And the Times’s Ginia Bellafante channeled a tweet I banged out into a great piece about our hypocrisy towards Amazon. Meanwhile, Dana Rubinstein of Politico did what she always does: She dug into Andrew Cuomo’s contradictions on the deal. We were pleased to see that the Daily News Editorial Board, Vin Barone at amNY and NY1 shared Streetsblog’s complaint about the city’s less-than-fair Fair Fares program. Incoming State Senator Alessandra Biaggi doesn’t like the Amazon deal. (NY Post) The Times offered other people who hate the deal. A drunk cop ran down and injured a pedestrian, said police, who arrested him. (NY Post) And a few hours later, the NYPD put out a statement (no link) that ANOTHER drunk cop did basically the same thing in the West Village. And, finally, it’s not really a livable streets story, but more of a livable fishing story. Watch this hilarious Sports Illustrated video featuring “urban fisherman” Mike Iaconelli picking up bass in the Gowanus Canal. last night at rush hour on 7th ave in the village, both the new parking protected bike lane and the parking lane were being used as general traffic lanes. Last night might have broken a record for regional gridlock — I was still checking out google maps at 10 pm, fascinated by the closures and dark red across the entire area. 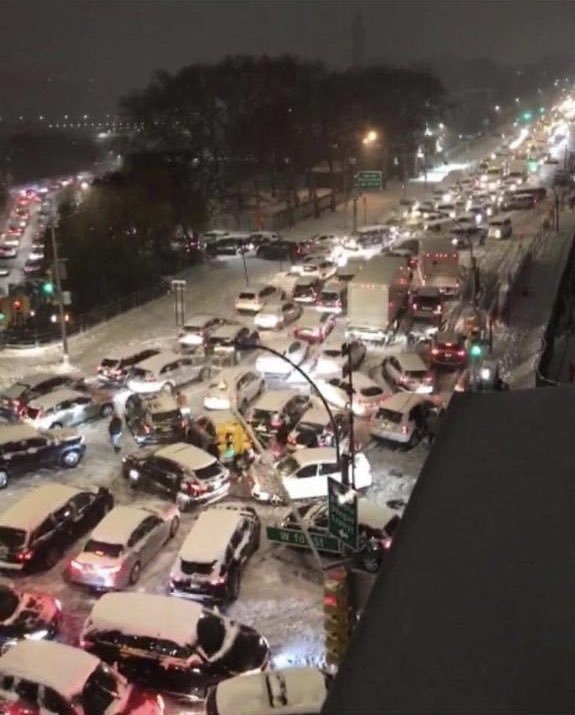 I’ve personally heard dozens of stories from residents in Upper Manhattan of commutes of 3 to 5 hours for distances of 3 to 5 miles due to a broken crosstown bus system (Bx12 basiscally stopped running), problems with subways (MTA proceeded with planned work, then recanted), incredible gridlock for miles in any direction from the GWB (intersections in Wash Heights and Inwood were still frozen as late as 11 pm) etc. It was really nuts. As in the boxing day storm, this one was worse than expected and the region was unprepared. I had heard 1 inch, washed away by rain, but that’s not what we got. Shouldn’t have affected the subways and trains at all, however. It was less than 6 inches. There was a guy on a scooter in Windsor Terrace riding a few feet, sliding sideways, falling over, cursing, and then going another few feet. I could tell the B35 was completely F’ed – because some of the Flatbush Ave dollar vans switched to running east-west on Church. One of my employees was stuck on the Turnpike for 4 hours in a bus that is normally 20 min from the PABT to Fort Lee. One of wife’s colleagues gave up after 2.5 hours and went back to the office in Wash Hts to sleep there rather than drive to Queens. Another person I know walked home to Inwood from the Bronx Zoo because the Bx12 was down. A friend who reverse commutes to Rockland County was 3.5 hours driving back. 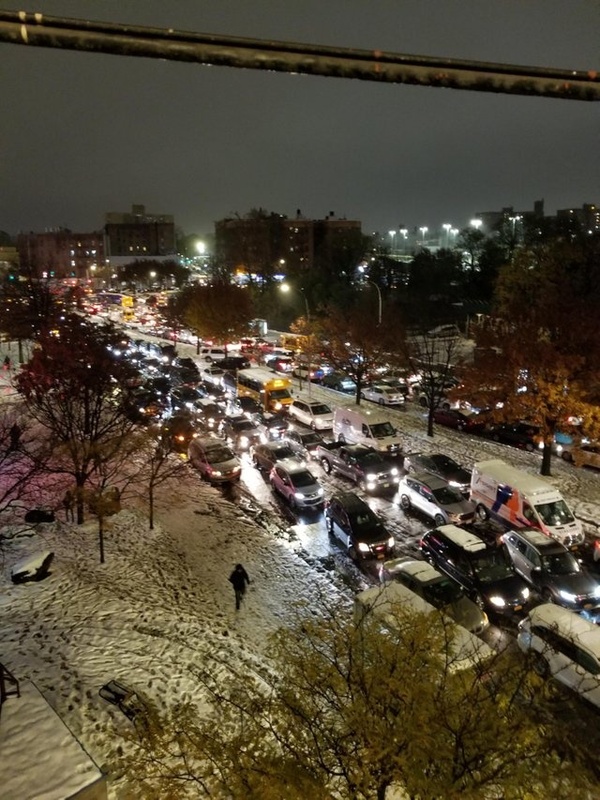 A schoolteacher friend was 5+ hours driving back uptown from her school. The 1 train switched to shuttlebuses due to planned work that was not cancelled (!) 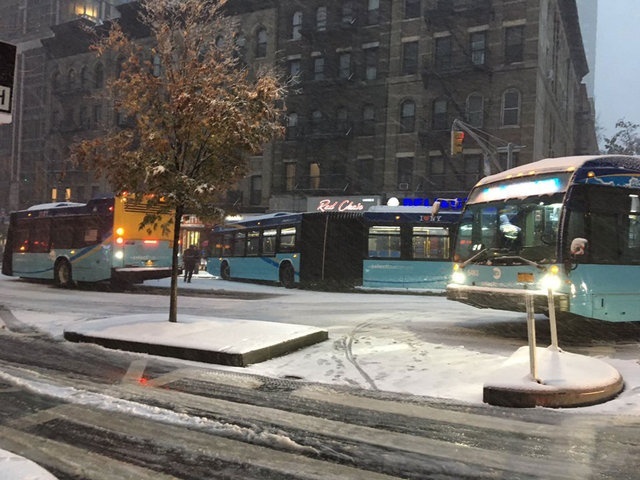 then resumed when the shuttlebuses didn’t move in Harlem. The subway service in the Bronx last night was a disaster. It’s frustrating because you would think that the subway would be the most reliable form of transportation in inclement weather, but signal problems were to blame. I really hope that upgrading the signal system in NYC will substantially reduce the occurrence of these delays, for the sake of the subway. The roads though were far worse. Even the side streets were swamped. What line? As far as I know all the signals in the Bronx have already been replaced in recent years, with traditional signals that may not be as advanced but ought to be reliable. The Pelham line and Dyre Avenue line had received new signals just before I started working in the program in 2001. The Concourse Line and White Plains Road line were getting new signals while I was there. The one thing worse than having old stuff fail is having relatively new stuff fail. Pelham. The delays increased my trip time substantially. I’m talking 8-10 minute waits per station. Those aren’t the ancient signals we have on the IND. The IRT is now all second generation, though the second generation signals in large parts of Manhattan are now approaching the 75-year drop dead date too. That’s unfortunate to hear. The 6 is usually pretty decent when I take it (BronxManhattan), afternoon and evening, but yesterday was the worst trip I’ve had in a long time. Normal trip time is around 30 minutes station to station, but it took me over an hour. Vin Barone and Dana Rubenstein give me hope that others beyond Streetsblog get it. Yesterday was a disaster for our streets and highways. As for buses, I’m just curious how much better streetcars handle snow versus buses. I guess if cars are blocking the tracks, it would be bad, but what if they have dedicated rights-of-way? Are rails better at handling snow than streets? Also, I heard no problems from MetroNorth riders, until they got to their park & ride lots in the suburbs. They couldn’t get home. Many chose to just walk home and left their cars in the lots. Many live close enough to do that every day but choose to use a car. Walking was mostly delightful (except for my friend who slipped and broke eggs). Getting across busy streets was easier with drivers keeping to <15mph. Intersections felt like shared spaces. Friend driving home on I-87/Deegan basically sat at Yankee Stadium for six+ hours. Not sure when she finally got home last night. Anecdotally, rails are at least an order of magnitude better handling snow versus buses. I recall my days commuting to Princeton on NJ Transit. Even on days which had the buses running at a crawl, once I got on the train, it worked as usual, even doing the usual 100+ mph between Princeton and New Brunswick. As for streetcars, the ones in the old days had “cow catchers” both to protect pedestrians and to push errant cars off the tracks. Modern streetcars can and should be equipped with something similar. Just look up Toronto news blogs (Torontoist, BlogTO, etc.) or newspapers (Star, Sun, etc.) to see. The short answer is they run just fine, but they are indeed prone to being blocked by cars or problems with tree branches on wires. The ones with their own ROW tend to do well. Here is West Farms at 12:30 AM. Was the Hudson River bike path plowed? Were the bollards lowered with hydraulics so that the plows could get through? Trains might not have been perfect, but last night basically shows how automobiles completely fail as transportation devices if pavement isn’t actively kept in perfect condition for them – at enormous expense to the general public – via sanding, salting and plowing. Every incline of more than like 10% grade last night was filled with drivers pointlessly spinning their wheels, and other drivers stuck behind those drivers, pointlessly honking at them, and hours-long stand-still backups for miles. My workplace has many city agency workers. Theyl have mass transit options from their homes to their work, but many choose to drive because they (illegally) park for free on the curbside outside their agency’s building and the NYPD do not ticket them. Many of them use their cars when they need to go in the field and are given parking placards and are reimbursed for gas – when they could execute their routes more easily walking, with mass transit or by bicycle. It has been found that many who use their own cars lie and put down higher mileage than actual – this is known – and yet the employees are still allowed to do it without consequences. But when the agency gives out metrocards an employee must be accurate in saying what each fare was used for or must pay it back – a far higher level of scrutiny than for those getting gas mileage reimbursement. So in multiple ways these city workers are incentivized to drive instead of to take mass transit. And that results in high volumes of traffic unnecessarily. If what happened last night would happen every night, people who have other options than to drive would make different choices on how to get around. Looks almost like something straight out of “The Day After Tomorrow”. Ugh. I remember working at city planning. When we did field work as a group, we would assemble at the office, waiting for the last worker to arrive. Then take the subway and head for the Brooklyn Navy Yard, where the old Chrysler K car assigned to city planning was located. Then get gas with a city gas card, then finally get to the location to be surveyed. When I did field work by myself, I would take mass transit to location one directly from home, survey it, then take transit to location 2, survey it, etc. Then take transit home and return to the office the next day. After having done three times the work. That’s with a clipboard. I’ll bet today it’s possible to do surveying by bike and enter the information on a smartphone. Somewhat more that 2x normal time isn’t completely horrible given the circumstances. Two years ago it took over 2 hours to get home from Penn Station. That’s normally a 40 to 45 minute trip. And it wasn’t snowing. It was the middle of summer, in fact. Not raining, either. I got lucky. I heard some people were stuck for several hours trying to reach their destinations yesterday. Suburbanites definitely had it the worst. I wonder how people with limited mobility got around. 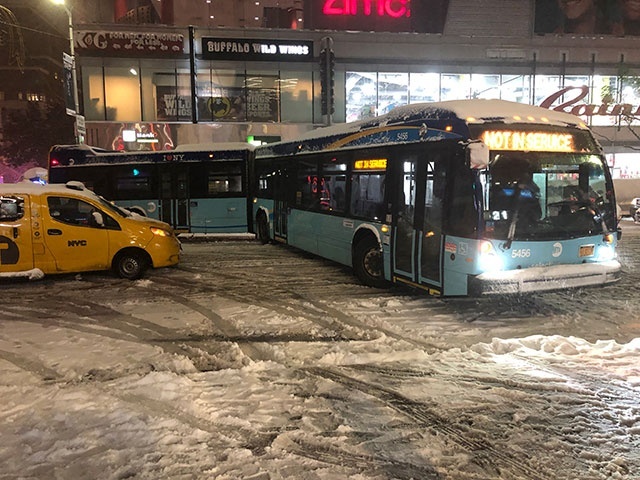 You had several inches of snow, stuck buses, no for-hire vehicles. Must have been a nightmare for those people if they lived a distance from the subway. Imagine those waiting at bus stops without shelters in that wind and snow. Your statement made me think of this article. I felt so lucky to have the heroes at the MTA running the subway well through the snowstorm. I struggled to walk through car-choked midtown, managed to get to car-free 6 1/2 Avenue, hopped on the subway, and enjoyed my 15 minute walk home in a very pretty, low-traffic winter wonderland. Everything went well. Then I made a note to support pols who understand the damage that congestion and climate change are doing to Manhattan in the short and the long run. Buses shouldn’t have been deprioritized to the extent they were, and that’s 100% on the mayor. Manhattanites who pay dearly to live close to the center of it all deserve so much better than having to listen to irate motorists honk outside their windows all night long. Our streets have a fixed capacity which can be maximized by travel mode, but the mayor seems determined to ignore that, run out his clock for another 3 years and let the next guy do the work of dealing with climate change, and prioritize the least efficient, most damaging modes of travel. We all need something better than this. But do they handle gloom of night?